time is absolutely flying by this fall, and it feels like i've barely had a moment to breathe, let alone write, cook, or do anything else that isn't 110% necessary. but despite the insanity and hecticness of life lately – and i'm sure i'm not the only one right now who's feeling it – i certainly haven't stopped thinking about food. i mean, COME ON! how can you not fall absolutely love with a tart-and-sweet, juicy fresh tomato the first time you taste one. i know there are a lot of tomato haters out there, but i can't help but believe it's because all those people have only had supermarket tomatoes. tomatoes picked too soon, before their peek of ripeness, and left in a big bin under horrific florescent lights to mush and mold and rot. but real tomatoes, straight-from-the-backyard-garden tomatoes, are an entirely different food altogether, and they are, hands down, one of the best treats on earth. fresh tomatoes are one food i can never, ever get enough of! and weirdly (or maybe not so weirdly), i most miss them in their simplest forms. sliced, with a little sea salt and pepper and perhaps, if i'm feeling a little fancy, a drizzle of olive oil. if i'm feeling extra fancy, maybe i'll even throw a little toasted bread and cheese on the plate as well, but at summer's height, even that seems superfluous. ripe tomatoes are perfection all by themselves, so perfect that it seems like doing too much to them will nearly spoil them. my granny – my mom's mother who still lives down in middle tennessee – always grew tomatoes in her garden. she also used to eat them straight out of hand, like an apple, with nothign but a shake of table salt. tomatoes are, in a word, heaven, and i think i miss them so badly when it starts to get cold and dark and the change of seasons really hits because they make me homesick. fresh tomatoes, dripping with seeds and juice, remind me of my grandparents and summers down south, of simple meals during simpler times, when we were all together, and when those basic little pleasures in life seemed like more than enough. now that i'm away from home – and missing going back for the holidays for the first year ever since i've moved away – i'm feeling especially homesick. and i can't shake that craving for ripe, late-summer tomatoes. if you're lucky enough to live where you can still get your hands on a couple, or if (like me) you're already dreaming of the day when they'll make their appearance again. 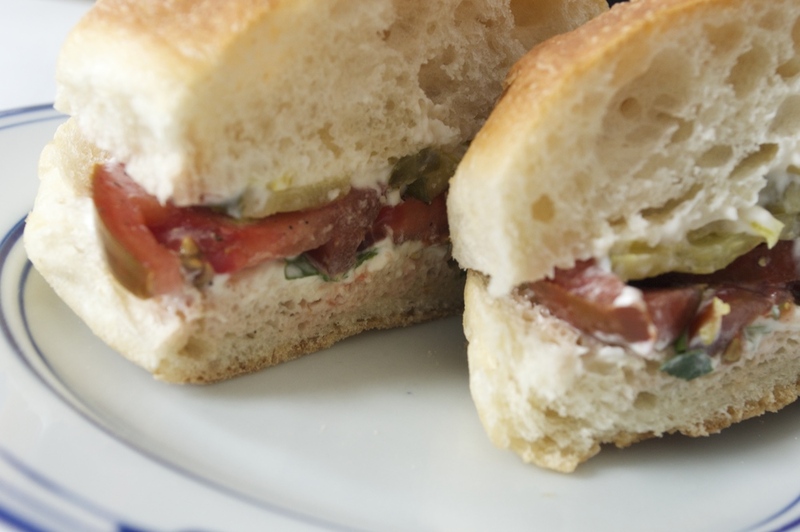 then savor their totally singualr taste with a simple preparation, like one of my childhood favorites for tomato sandwiches, or the slightly jazzed up (and i guess, maybe more grownup?) tomatoes on toast below. this is a throwback recipe, one that reminds me of my childhood, so i'm keeping it super simple here, i also always, always use soft white bread of some kind. sorry – and i'm normally all for getting as many whole grains into my diet as possible – but this just doesn't taste right to me on anything but white bread. if desired, toast your bread (but this first step is entirely optional). spread both pieces of bread with a (very) generous dollop of mayo on one side. 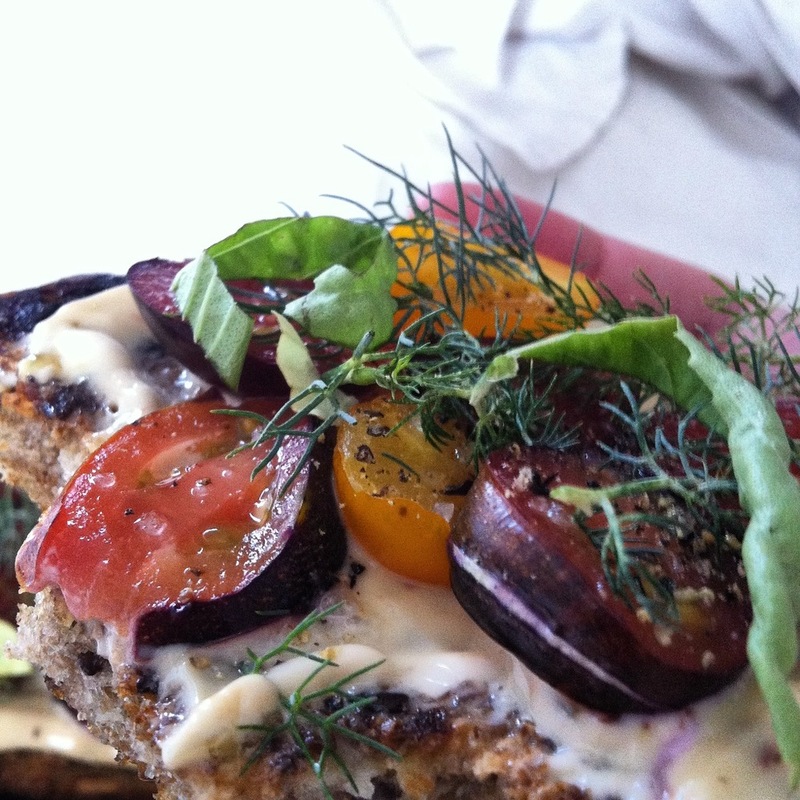 on one piece of bread, on top of your mayo, placed the watercress leaves. then stack several tomato slices – as many as you think you can get on there without the sandwich totally falling apart later. sprinkle tomato slices with salt and pepper to taste. top with remaining bread piece. i know it sounds insanely simple – too simple to be as good as i'm making it out to be – but just trust me on this one. 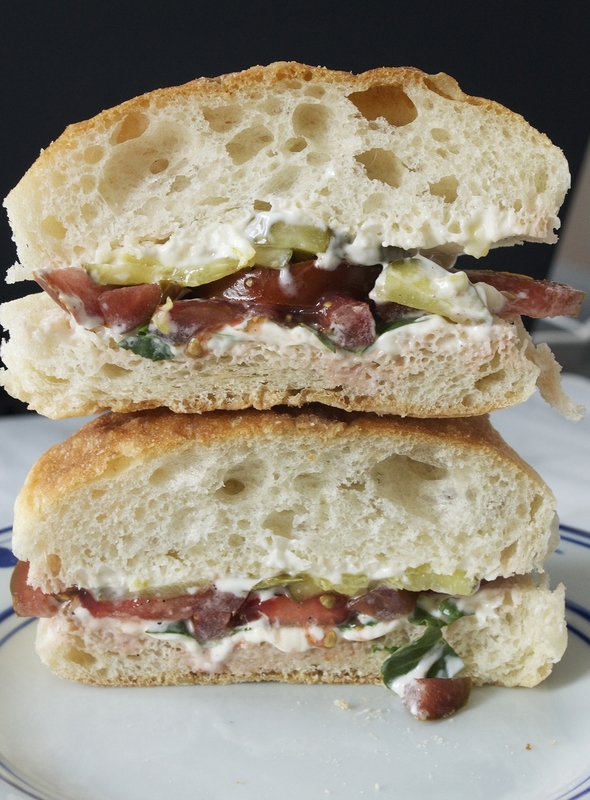 if you didn't grow up eating tomato sandwiches or tomato-and-pickle sandwiches, then this is something you need to try, like yesterday. and the "fancy" version is basically just an open-faced version of the above. here, i did use a hearty, whole-grain bread, which i toasted. i mixed a little sweet balsamic vinegar into my mayo (you'll need about 1 1/2 teaspoons vinegar to each tablespoon of mayo). then top with tomatoes, salt, and pepper, and all kinds of fresh herbs. i used my two summer favorites, basil and dill, but you could also use parsley, cilantro, chives, or whatever else you have lying around and/or just can't get enough of in the middle of the summertime heat.